Deal Castle is a Tudor coastal artillery fortress, located right on the beach in the town of Deal within the county of Kent, in South-Eastern England. 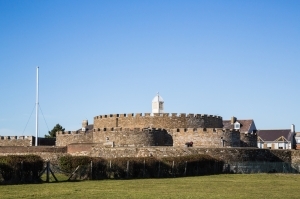 It was constructed in the 16th century and is located almost equidistantly between Walmer Castle and Sandown Castle, since its particular location was chosen to guard a particular stretch of water, known as the Downs, which at the time was used as an anchorage and landing ground. Deal Castle is one of the earliest and most elaborate of the Device Forts, also known as Henrician Castles, built by King Henry VIII to counter the threat of invasion brought about by the alliance of France and Spain, formed after he embraced Protestantism and was excommunicated from the Catholic Church, after he divorced his first wife, Catherine of Aragon. Deal Castle is built out of Kentish ragstone brick and Caen stone, probably taken from nearby religious houses after the Dissolution of the Monasteries (1536 – 1541), that is, when Henry VIII, newly turned to Protestantism, disbanded all Catholic buildings and institutions and disposed of their assets. 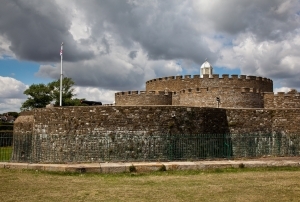 Deal Castle was probably designed by the German architect Stephen von Haschenperg. The unusual design of the castle is said to have been an attempt at emulating the form of the Tudor Rose, which at the time was the traditional floral heraldic emblem of the Royal family. The plan of Deal Castle is symmetrical, with a low round tower at its centre. Around the tower there are six smaller semi-circular bastions, and a further series of six larger bastions in the curtain wall. During the 1570s, the outer bastions were packed with earth, probably to strengthen the gun mounts on the roof. The top level of the bastions in fact, served as a platform for the heaviest guns. A continuous gallery, known as ‘the rounds’, runs around the basement level of the bastions, and is pierced by 53 hand gun-ports and loopholes to allow the defenders to fire into the bottom of the moat, which protects the whole fortress. The moat, which is 20m wide and 5m deep, was aimed at stopping attackers from reaching the walls. The outer bastions have gunports to allow muskets leeway to fire and cover the ditch. There is also a sally port between two bastions which would have given the defenders the ability to counter any attacks into the ditch. Behind the outer bastions themselves, there was also a smaller ‘inner ditch’, which permitted the garrison to abandon the outer bastions and retreat inside the inner defences once their main walls were breached. The inner ditch was covered by gunports placed in the inner fortress. Originally, the outer moat was crossed by a wooden drawbridge. This has at present been replaced by a stone causeway, however the slots, which were used for raising the gear of the drawbridge, are still visible. The westernmost bastion is taller than the others and serves as a gatehouse. Defensive features incorporated within the gatehouse include five murder holes and a gunport covering the doorway. Currently, a small museum is to be found within the gatehouse. All of the Castle’s outer walls are rounded, in order to provide protection and deflect any shots, most especially cannon fire coming over the sea. The citadel and outer bastions were originally capped by rounded parapets pierced by embrasures for guns. Some of these survive, but most were replaced in 1732. The walls originally incorporated around up to 145 gun ports on five levels. The castle provided accommodation for a peacetime garrison, while the officers lived in the upper floors. The ground floor was used to house a bakery and a kitchen, and in fact one can still see the brick ovens and the fireplace. There is also a small pit, which is thought to have been used as a small forge, for the maintenance of weapons and armour. There is also a large well in the centre of the vaulted basement, which was also used to store ammunition and supplies. Apart from the officer’s quarters, which were refurbished during the 18th century, the crenallations on the inner walls, which were added in the 17th century, and the captain’s residence, destroyed during the Second World War, the castle today is as it was during Tudor times. 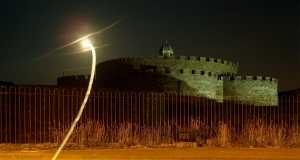 Deal Castle is set low on the ground quite deliberately, as this ensured that it presented a harder target for an enemy to attack from the sea. Its exterior features are spectacular, however unfortunately one cannot access the top floor or the roof, since these were permanently destroyed during the Second World War. The Castle is easily reachable, since it is to be found quite a short distance away from Deal Station, which is comfortably accessible by road. It also has free parking space nearby. Apart from visiting the Castle, one can also enjoy the provided audio tour, and the gift shop. Times pertaining to other dates will be announced on the official website in future.